The power supply shown is of common design using a 6X4 full wave rectifier with choke filtering. 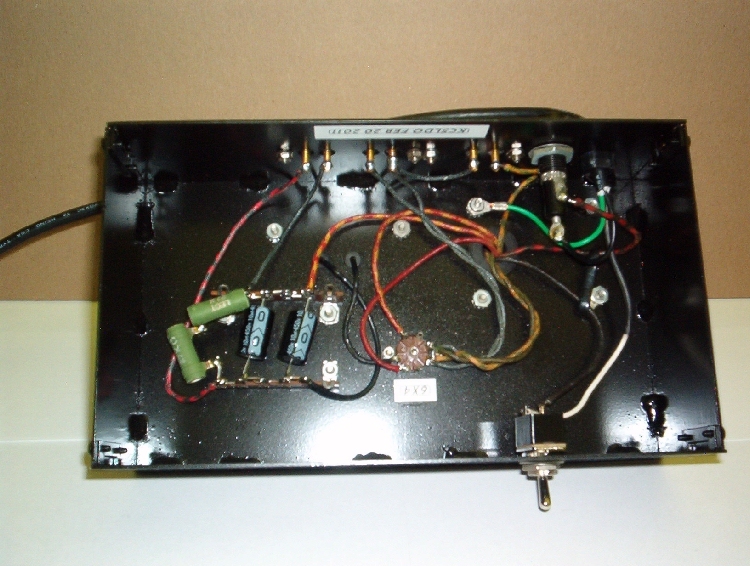 I built this project to power the 6AQ5 transmitter and to supply B voltage for the Hartley transmitter. With the components used in the schematic, it provided 245 VDC for the plate and 6.3 VAC for the 6AQ5 filament. By choosing the correct transformer this design can also be used to power other projects. While this P/S was under construction, I noticed that my transformer had a center tap on the 6.3 secondary. Since the Hartley's type 27 tube requires 2.5 VAC for the filament, I wondered if I could make the 6.3 V center tap work. Measuring the voltage between the 6.3 V secondary leads I measured 3.1 volts. A bit high for the 27 tube. Once the P/S was finished I connected the Hartley and measured filament voltage at the pins of the 27 tube. It was a bit high at 2.9 volts. After giving some thought, I decided to try a trick I had almost forgotten about. By experimenting with different lengths and gauge of wire between P/S and the Hartley, the problem was solved. Using 20 ga. stranded wire cut to 42 inches, I brought the filement voltage down to a 2.5 volts for the type 27 tube. The two wires had the right amount of resistance to lower the voltage. 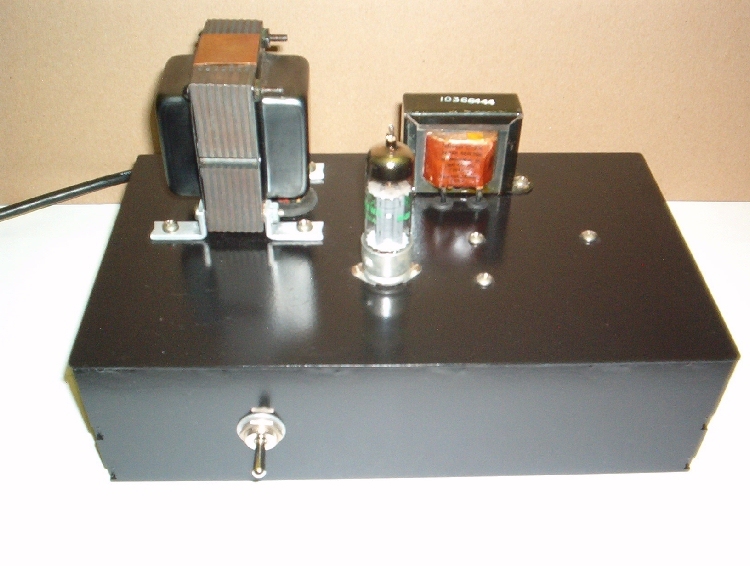 I am very pleased with one P/S being able to supply 245 VDC, 6.3 VAC and 2.5 VAC. 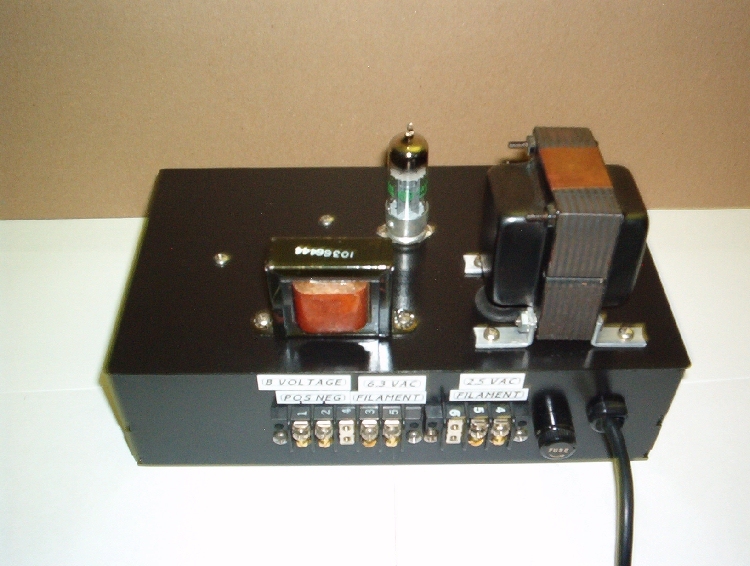 High voltage tube power supplies can be dangerous and lethal if caution is not observed. Seek qualified help if you are not familiar with high voltage supplies.